 Vagnsset med 2 bulktransportvagnar Faccns "MBC"
Vagnsset med 2 bulktransportvagnar Faccns "MBC"
By buying this product you can collect up to 949 bonuspoints. Vagnsset med 2 bulktransportvagnar Faccns 'MBC', totallängd över buffertar 29 cm, epok VI. 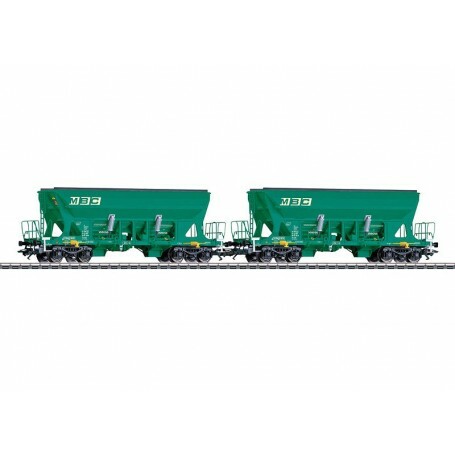 Prototype: 2 different type Faccns four-axle hopper cars. Privately owned cars painted and lettered for the firm MBC, Transports de la region Morges Bière Cossonay SA, CH-1110 Morges 2, Switzerland, registered in the Czech Republic. The cars include platforms at both ends and ladders going up from the platforms. The cars look as they currently do in real life. Model: Both cars have detailed, partially open frames. They also have separately applied platforms and end ladders. Both cars have different car numbers and are individually packaged. There is also a master package. Length over the buffers per car 14.5 cm / 5-3/4'. This product was done in cooperation with the firm Tillig Modellbahnen GmbH & Co. KG.